If you grow summer squash, then I know you are always looking for new ways to use that VERY prolific vegetable in your cooking. This is our latest find, an inspiration from My Recipes. The recipe is tweaked to fit our dietary specs, but the foundation comes from My Recipes. 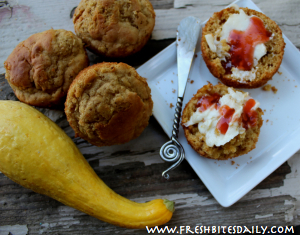 When you want to be really sneaky with the summer squash in baked goods, use yellow squash. By the time the baking is complete, you have to look closely to find the squash. This is one of the tweaks I made on the original recipe. The other significant change is in the flour of choice. I tried Bob’s Gluten-Free Baking Flour. Actually, I made two batches of muffins: one with plain white flour and the second with gluten free. I wanted to see in a really controlled situation what difference the gluten-free flour makes. Surprise! The batch made with gluten-free flour rose higher and had a nicer texture. This is not a very sweet muffin which makes it perfect for enjoying some of your freshly made summer jam. We’ve been loving these muffins with blackberry jam, thanks to our bumper crop of berries this year. Oil a 12-cup muffin tray. In a large mixing bowl blend the flour, sugar, baking powder, lemon zest, salt and nutmeg. Combine thoroughly using something like a wire whisk or pastry blender. In another smaller bowl mix together the squash, milk, coconut oil and egg. Shape a well in the middle of the dry ingredients. Pour in the wet ingredients. Mix just until the dry ingredients are mixed into the wet ingredients. Do not beat or over-mix. Divide the batter evenly between the 12 muffin cups. Bake in a 400 degree oven for about 20 minutes when the tops begin to brown and when an inserted toothpick comes clean from a muffin. Enjoy with butter and jam. For leftovers: split them in half. Butter the halves and toast in a toaster over. Delish! 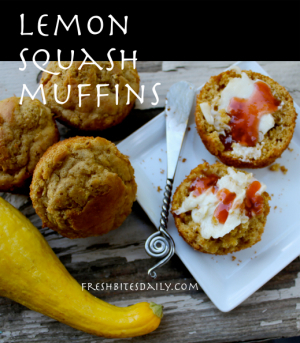 1 Comment on "Lemon-Squash Muffins"
I am going to assume that you meant to say 1/2 CUP sucanat. Looks yummy! Need to try these soon. Thank you!